Martyr's Day is annually observed in Tunisia on April 9. This observance commemorates the Tunisians killed in 1938. 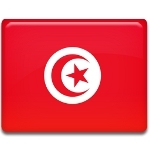 Tunisia became a French protectorate in 1881, when the country was invaded by the French troops. The French policy was not supported by the locals, which led to the birth of movement for independence. In 1920, the Constitutional Liberal Party, most commonly known was Destour, was established. It aimed to liberate Tunisia from the French colonial control. The group of Tunisian nationalists founded the New Constitutional Liberal Party, commonly known as Neo Destour, in 1934. Both parties wanted to gain independence for Tunisia from France, but their actions were aimed at different layers of the population. Neo Destour initiated a national uprising that began on April 9, 1938. The colonial troops opened fire on demonstrators, at least 22 Tunisians were killed and several hundred wounded. The leader of the party Habib Bourguiba and his followers were arrested and deported to France. Nowadays April 9 is the day, when the Tunisians commemorate those people, who died during the uprising in 1938 and those, who gave their lives for independence of the country.